If you were wondering where Ludovic Lefebvre had gone, look no further—we have found him. After L’Orangerie and Bastide, he resurfaced with Ludo Bites at Breadbar in 2007 for three months, then disappeared from Los Angeles altogether and landed on the Las Vegas strip, until he left there last May. 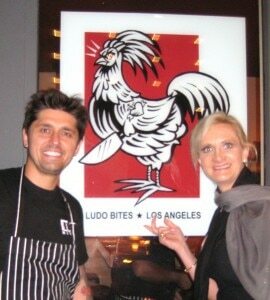 Given the past success of Ludo Bites, he is again serving his cuisine with the same concept, where it originated. He rents the Breadbar space on Third Street (only open for breakfast and lunch) for dinner. You will find him there for three months, until August 22. It is like a temporary art exhibit; it moves around, and you don’t always know where it will be next. If you have never tasted Ludo’s cuisine, isn’t he sort of an artist anyway?